Colorado Criminal Law - What If I Run? - Absconding - Fleeing A Colorado Criminal Case - Evidence Of Flight At Trial - Denver Criminal Attorney Specializing in Domestic Violence Cases - Colorado Criminal Defense Lawyer. Colorado Criminal Law – What If I Run? – Absconding – Fleeing A Colorado Criminal Case – Evidence Of Flight At Trial – An immediate reaction to the fear of a criminal prosecution is what is commonly known as the “flight” response. It is a natural fear, and while it occurs often, few actually flee the state. This article addresses the impact of “flight” evidence in Colorado criminal cases. There are two basic types of flight in a Colorado criminal case. Another basis for the admission of evidence of flight is the rationale that in a criminal trial evidence of flight indicates a “guilty mind” from which “guilt (of the crime charged) itself may be inferred.” Evidence of flight is therefore admissible because it makes it appear more likely that the accused committed the charged offense – that is, the evidence makes it “look like” the Defendant is guilty and his guilt is more probable than it would be without such evidence. (CRE 401). While it may seem to the reader to be just “legalese,” it is important to know how evidence that a Defendant fled Colorado weeks, if not months, after an arrest could be admissible at their criminal trial. The answer is a doctrine of law known as “res gestae” evidence. While O.J. Simpson was acquitted by a criminal jury, the reader may recall his attempt to flee in his white SUV. That evidence was admissible at his trial to show “consciousness of guilt” on Simpson’s part. But – and this is very important – for flight evidence to be admissible, the State must prove that a Defendant was concealing himself to avoid apprehension. Put differently, evidence of flight and concealment to avoid arrest is only admissible to show “consciousness of guilt” IF it can be shown the Defendant was aware he or she was being sought by law enforcement. Even more importantly, is the rule that flight evidence, standing alone, is NOT sufficient to support a conviction of the crime charged because it is not proof of the crime itself, but is only considered “corroboration” of other evidence in the case and is relevant on that basis. Another Hidden Danger – The Charge of Violation Of Bail Bond Conditions – Mandatory Consecutive Jail – 18-8-212, C.R.S. Also laying in the weeds is the fact that evidence of flight also may constitute another crime – that crime is called Violation of Bail Bond Conditions 18-8-212 and this law mandates – if a Defendant is convicted – a sentence to jail or prison that must run consecutively to the offense on which the person is on bail. You should be careful to make a responsible choice in selecting a Colorado Criminal Defense Lawyer – and we encourage you to “vet” our firm. Over the last 30 plus years – by focusing ONLY on Colorado criminal law – H. Michael has had the necessary time to commit to the task of constantly updating himself on nearly every area of criminal law, to include Colorado criminal law and procedure and trial and courtroom practice. H. Michael works hard to get his clients the best possible results in and out of the courtroom. He has written, and continues to write, extensively on Colorado criminal law and he hopes this article helps you in some small way – Colorado Criminal Law – What If I Run? – Absconding – Fleeing A Colorado Criminal Case – Evidence Of Flight At Trial. An immediate reaction to the fear of a criminal prosecution is the "flight" response. It is natural and while it occurs often, few actually flee the state. 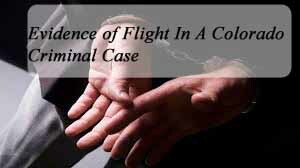 This article addresses the impact of "flight" evidence in Colorado criminal cases.